During the first weekend in October, one of my best friends and I took a mini-haunted road trip. This week, I’ll be posting a two-part series detailing our adventures. All photographs appear courtesy of Anjoli Anand and myself. It was pouring, of course; after all, we were going to hunt ghosts. To be honest, I didn’t actually think we were going to find any — but that wasn’t really the point. The point was to visit a few places we’d hitherto only read about, and to see whether the legends held true. 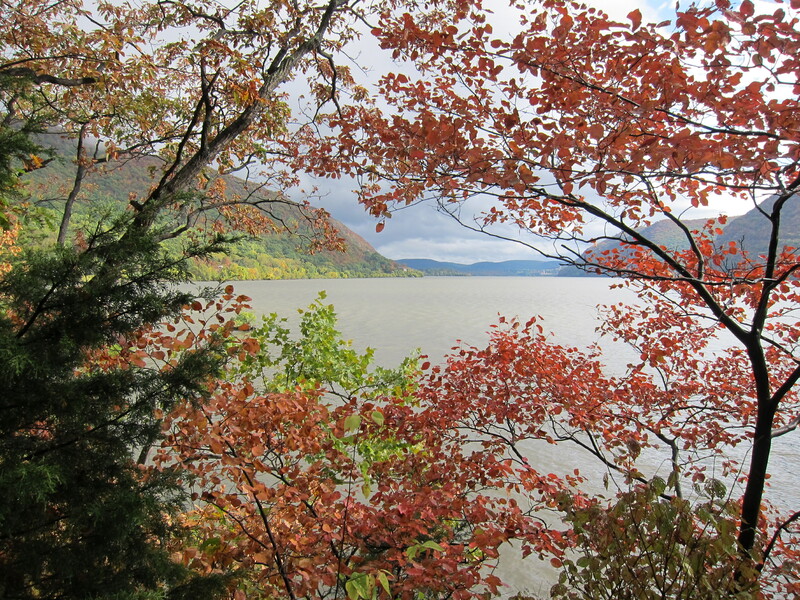 If you’re going to take a haunted road trip, there’s no better time than of year than fall — so on October 4, one of my frequent partners in metaphorical crime, Anjoli, and I set off in a borrowed car and drove north, leaving New York City behind in favor of the Hudson River Valley. Our first stop: Beacon, NY. 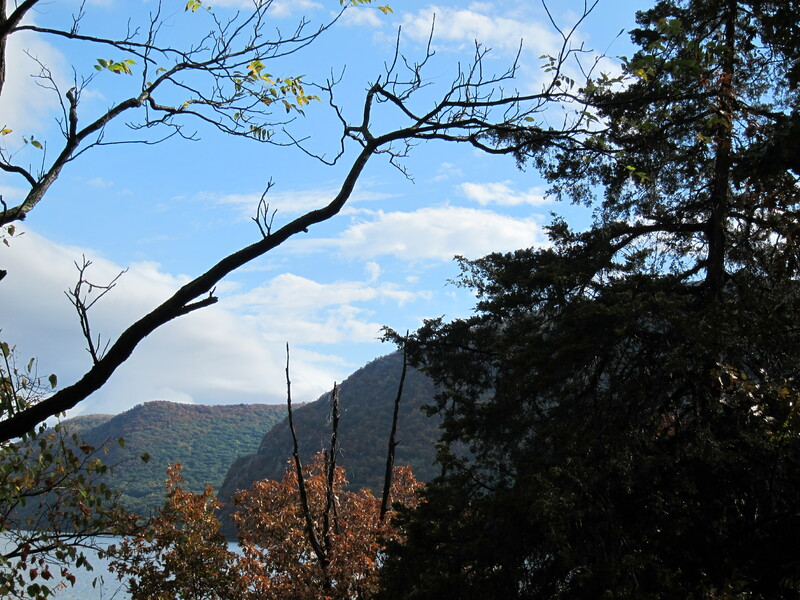 Just off the coast of Beacon in the middle of the Hudson River lies an island. 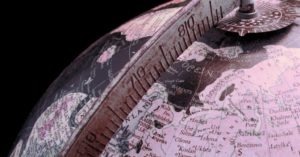 It’s uninhabited, but that doesn’t mean that it’s empty; on the contrary — it’s full of history. 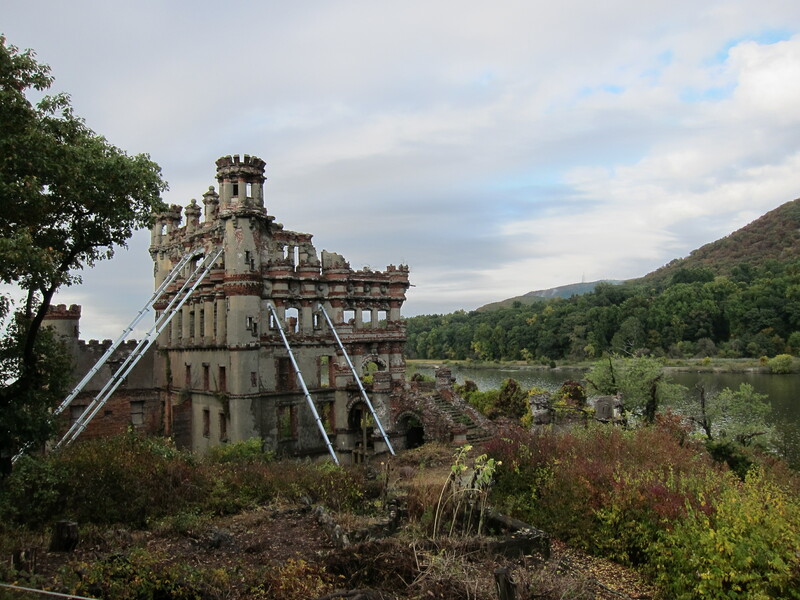 The island is known as Bannerman Island, and it houses the remains of an honest-to-goodness Scottish castle. Industrialist Francis Bannerman VI purchased the island in 1900, when he was 49 years old. Born in Dundee, Scotland in 1851, he moved with his family to the United States in 1854; they settled in Brooklyn in 1858. Bannerman’s father spent the boy’s childhood building up a military surplus business, and by the time young Francis grew old enough to join in, Bannerman’s was a world-renowned arms and ammunition business. The original idea behind the purchase of the island was for it to be used as a safe storage site for the weaponry on which the family business thrived; all that gunpowder and other explosive matter had to go somewhere. Going back to his roots, Bannerman also built a Scottish castle he designed himself on the island, as well as a smaller, simpler residence in 1901. 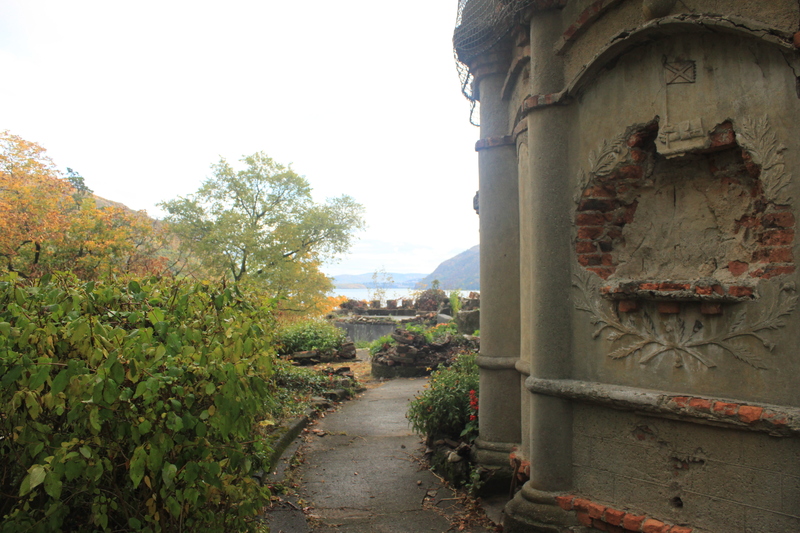 Although no one knew it at the time, Bannerman’s death in 1918 heralded the beginning of the end for Bannerman Island. 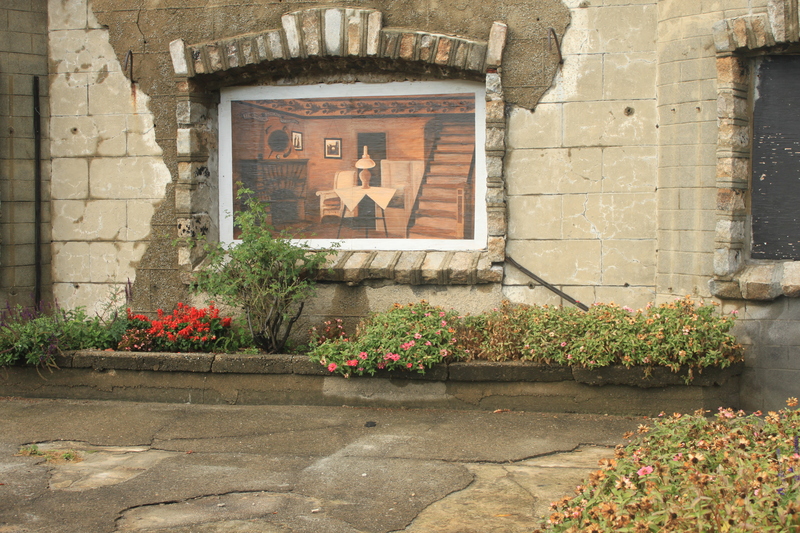 The powder store exploded in 1920, ending its role as both a powder store and a residence; then in 1950, a storm sank the ferryboat that serviced the island, and the land and its buildings were left to rot. 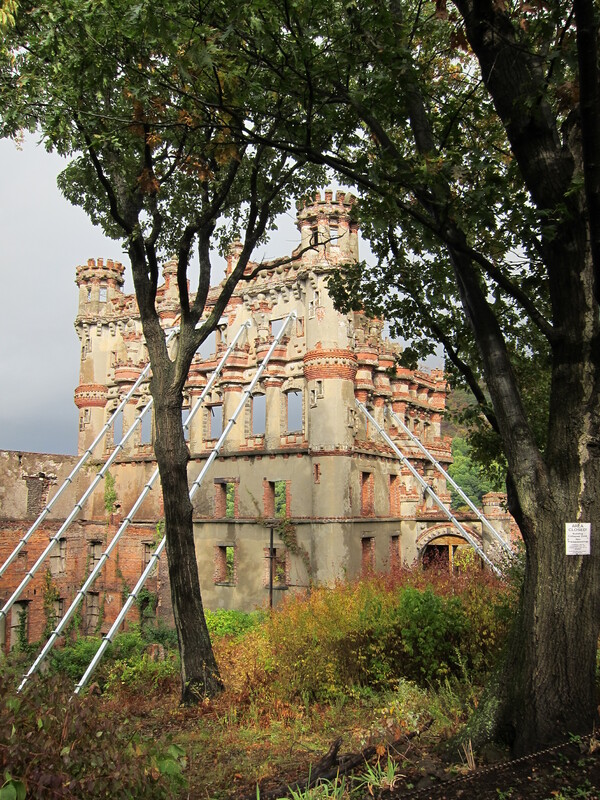 New York State purchased Bannerman Island in 1967, and after the removing the military merchandise, began running tours regularly, seemingly given the island new life. 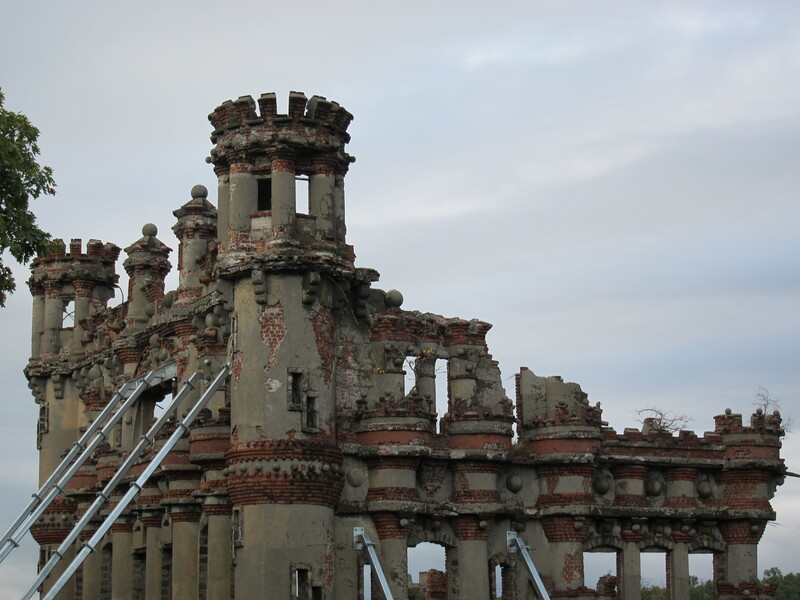 But in 1969, a fire gutted the arsenal — the imposing, castle-esque structure the island is best known for — and Bannerman Island was placed off-limits to the public. 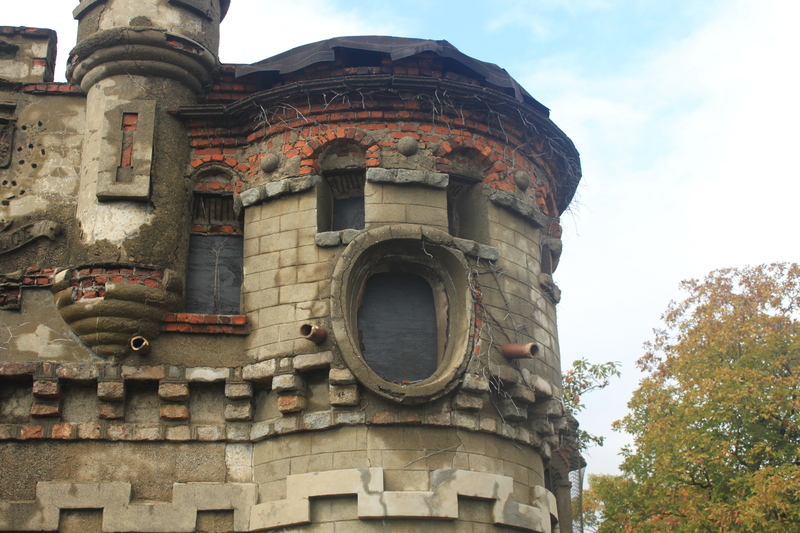 For the past 20 years, however, the Bannerman Castle Trust has made it their mission to restore the island and prevent further damage to its failing buildings. 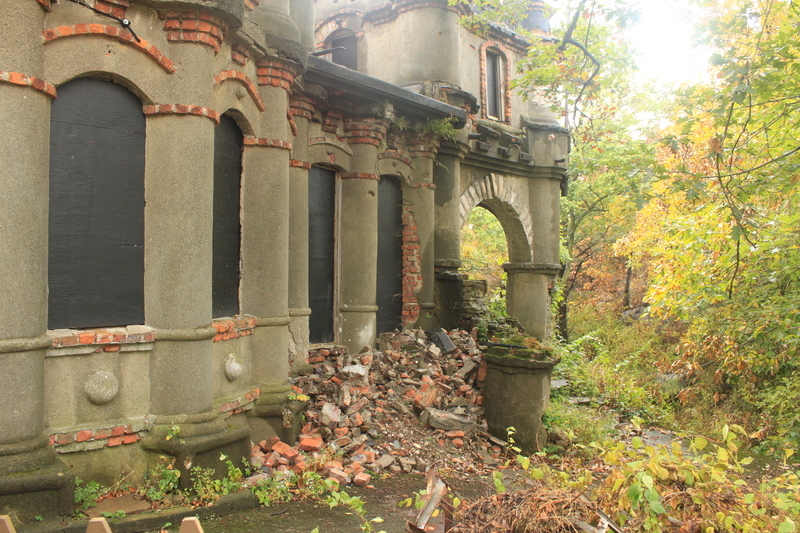 The official New York State Office of Parks, Recreation and Historic Preservation’s “Friends” organization for the site, they’ve cleared the paths, buttressed the walls, and begun running tours, again opening up the island to the public. It was members of the Trust whom we met on the dock that rainy Saturday, ready to carry us over to the island by boat and regale us with tales of the strange and unusual. 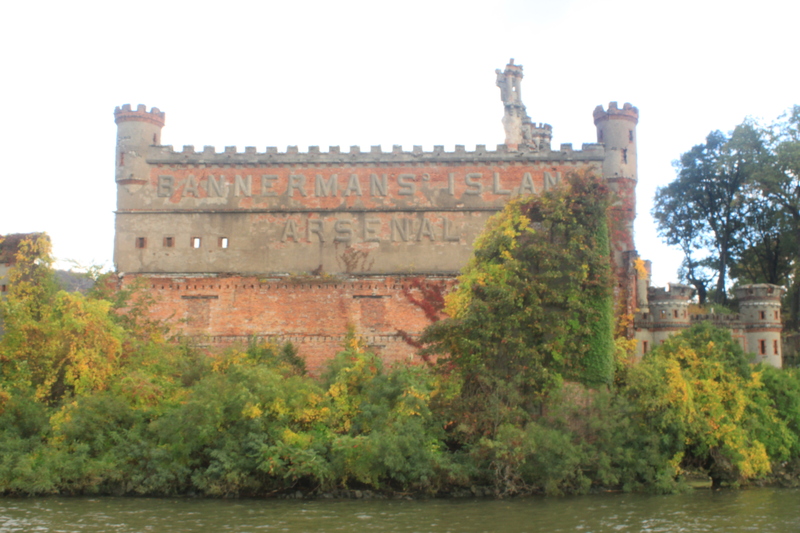 If rickety old ferries make you nervous, you’ll probably want to stay away from Bannerman Island. 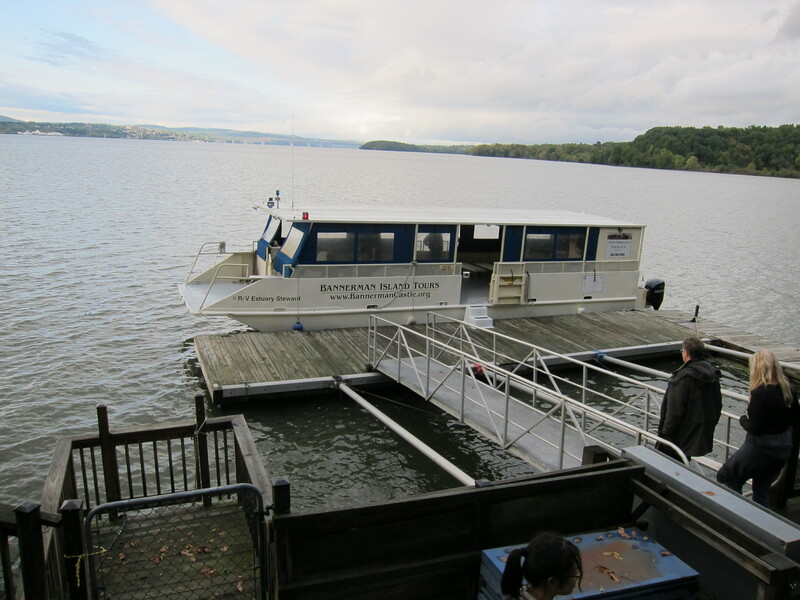 The boat employed by the Bannerman Castle Trust is perfectly seaworthy vessel, and it’s crewed securely and competently — but it definitely doesn’t look like much, especially under a torrent of rain. But as soon as we checked in and filed on board, the storm began to lighten up, finally ceasing entirely and allowing the sun to emerge. 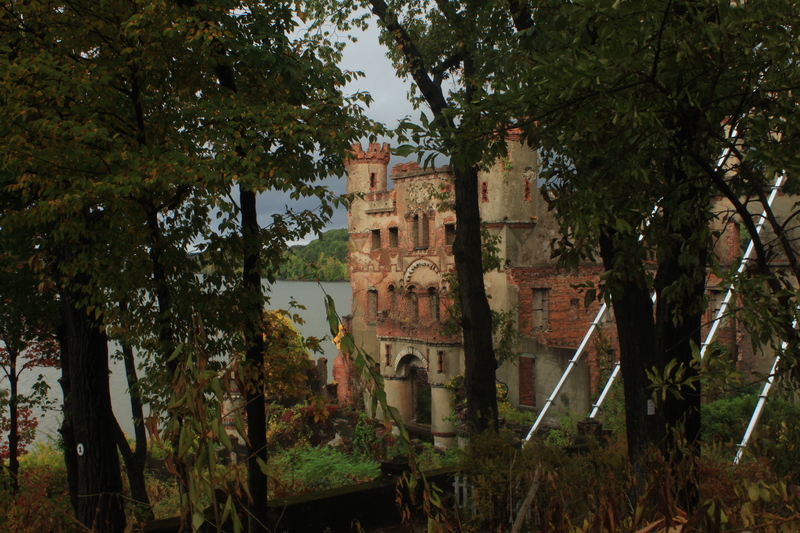 Just as the sun began peeking out from behind the clouds, it loomed large in front of us: Bannerman Island, and the crumbling castle perched upon it. As we wandered around the island, stumbling over the uneven ground and getting caught on errant branches, our guides told us the stories we had come to hear. Even before Bannerman got a hold of it, you see, the island had earned itself a history rich with legend. Dutch sailors called it Pollepel Island, a word that means “wooden ladle”; another story, however, alleges that the name comes from a young woman called Polly Pell. According to the story, Polly ventured out in a sleigh onto the frozen Hudson with one of her many suitors — but when the ice started to melt, another suitor rescued both her and his rival from the breaking ice, bringing them to the island for safety. The suitor Polly had initial ventured out with was, as it turned out, a man of the cloth; he was so grateful to his rival for rescuing them both that he married the two of them on the spot. But not all of the stories attached to place are rosy and romantic; many of them, in fact, prey on fear. Native American tribes in the area allegedly refused to set foot on the island at night, claiming malevolent spirits emerged when the sun went down. The Flying Dutchman is regularly spotted out in the distance, the occurrence of which appears as a thinly-veiled legend in the Washington Irving story “The Storm-Ship.” An angry tugboat captain, furious at the sinking of his ship to form a breakwater for the property, cursed Francis Bannerman; servants at the grand lodge, hearing the ringing of a tugboat’s bell when no tugboats were nearby, believed it was a sign that the captain had returned to take his revenge. And although the lodge’s drawbridge has long since fallen into disrepair, sometimes the clatter of horseshoes traveling over it can still be heard. 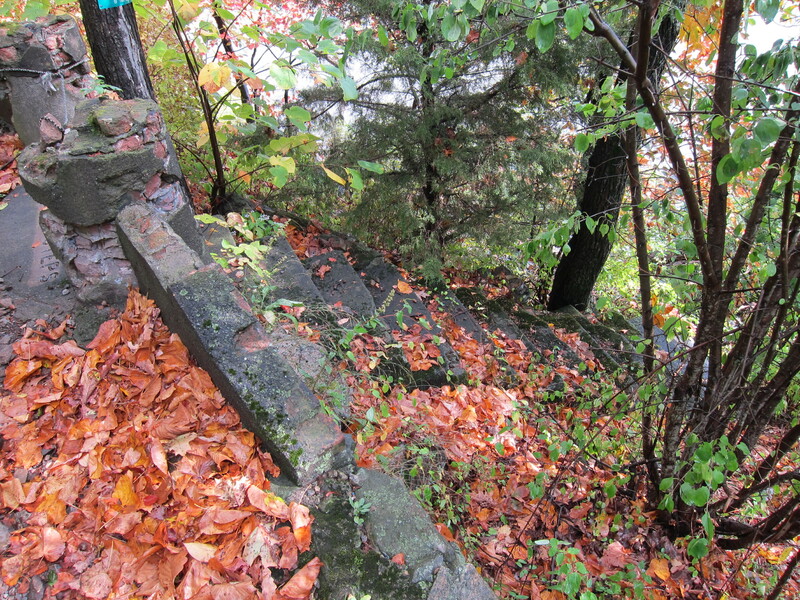 And then there’s this one: Visible from the back of the island, near the stone stairs known as the Wee Bay Steps, the Metro North railway tracks hold a somewhat unexpected story of their own — one that doesn’t involve the Bannermans. After Abraham Lincoln’s assassination in 1865, the President’s body and that of his son, Willie, made their way across the country by train in a funeral procession on April 25. On its way to Albany, the train passed through every town along the Hudson River — but although the train itself eventually completed its journey, some say that a shadow of it repeats its performance once a year: On April 25, a ghost train is said to be seen, passing through each and every town along what is now the Metro North, charged by the grief of a nation in mourning. And another: When they were in residence on the island, the Bannerman family lived in a structure smaller than the main lodge, but no less grand. 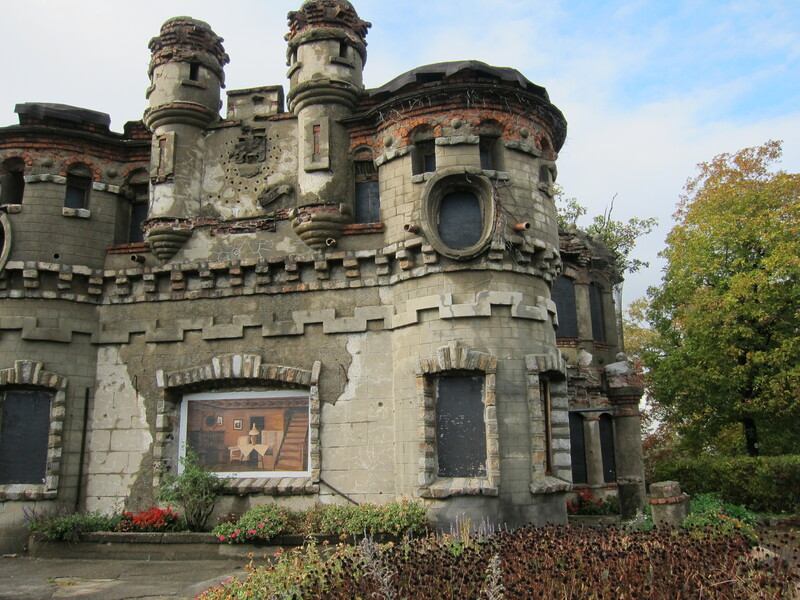 Eventually the Bannerman Castle Trust hopes to turn the remains of the residence into a visitor’s center; for now, though, it remains roped off, its doors shut and its windows boarded up. Perhaps the most interesting story, however — and possibly the truest one — takes place right out front. On the day in 1920 the powder store exploded, Francis’ widow, Helen, was sunning herself in a hammock outside near the rose garden. It’s said that shortly before the explosion rocked the island, she felt a presence of some sort telling her to go inside. Just after she moved, leaving the hammock behind, the powder went up — and a chunk of masonry dislodged by the bang landed right where her head had been seconds before. 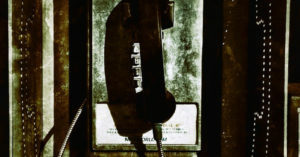 Ghost hunters investigating the island have noted crazy EMF readings located around the house; additionally, mediums have claimed they’ve felt a frantic sort of energy centered in the same spot. If you believe not in ghosts as spirits, but rather as memories, this energy might be the imprint of all those present the day the powder store went up in smoke. The Haunted Legends tour is new (up til this year, all tours have been historical in nature only); as such, the Trust and its guides are still working out a good deal of the kinks. 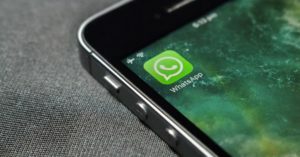 As someone who grew up around historic sites, I’m experienced enough with tours to be able to identify what worked and what would use some work. The stories were sometimes a little difficult to follow; most of us didn’t have a strong grasp of the island’s actual history going into it, so we lacked the background that would have given the spooky stories some much-needed context (the brief history of Francis Bannerman written here was drawn from research I conducted after the fact, not from information I learned on the tour). Weaving the ghostly tales in and out of the actual history of the island would probably give the whole thing a little more cohesion, which could ultimately be used to great effect. The best ghost stories, after all, temper fiction with fact, convincing us that no matter how fantastical it may seem, it has its roots in reality. 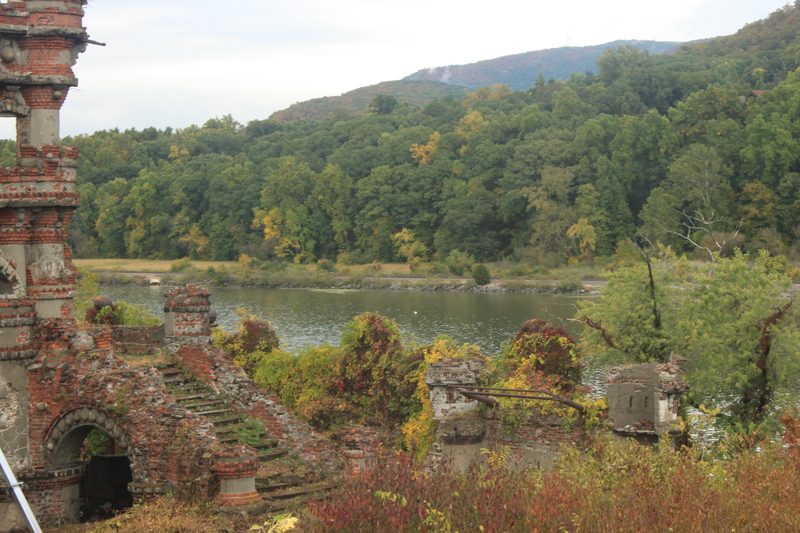 But even without the stories and the history, Bannerman Island is plenty haunting all on its own. There’s something beautiful about abandoned places; even if they’re not inhabited with literal ghosts, they’re often heavy with the ghosts of their former glory — what once was, and what will likely never be again. Although I’m sure turning the Bannerman home into a visitor’s center will be wonderful for the island, I’m glad I got to see it before that happened. Without it, it’s more… I don’t know. Itself, perhaps. Did we have any close encounters with the third kind ourselves? Not really — although one curious incident might be worth noting: As we stood around the island’s old well, just before hearing the story of Lincoln’s ghost train, a sharp crack shot through the air. A large, unwieldy tree branch suddenly and violently detached itself from the heights of a nearby tree, narrowly missing a few of us as it crashed to the ground. I’m quite certain it can be chalked up to an old tree having withstood heavy rain and wind just an hour before — but the word that had been spoken by our guide just before the branch fell? 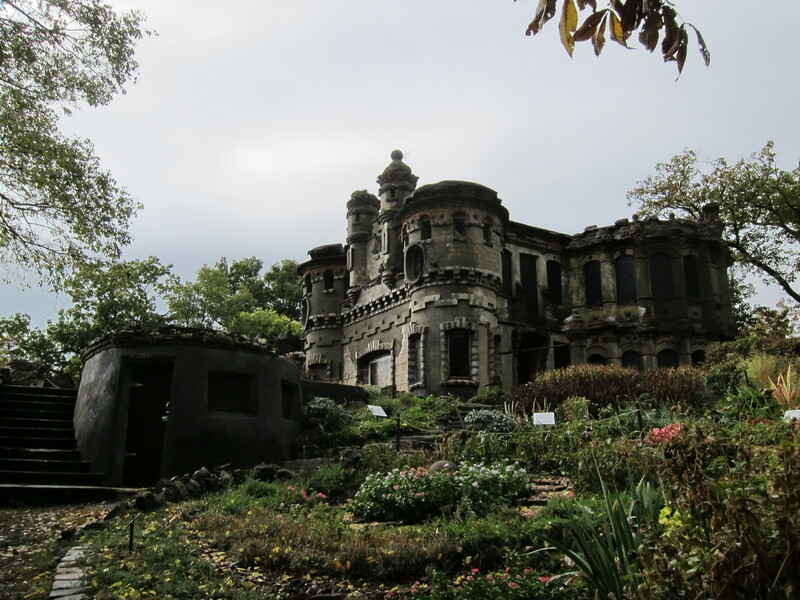 Bannerman Castle Trust – Island History. 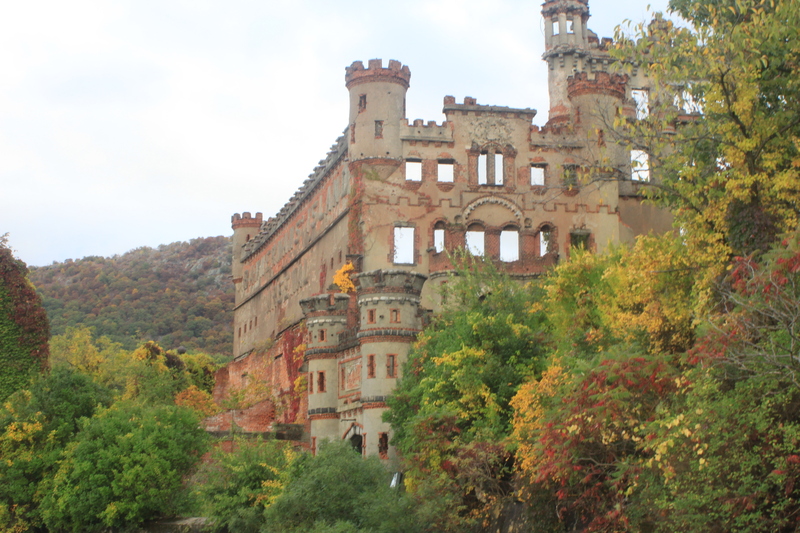 Ghosts and Goblins of Bannerman Island. 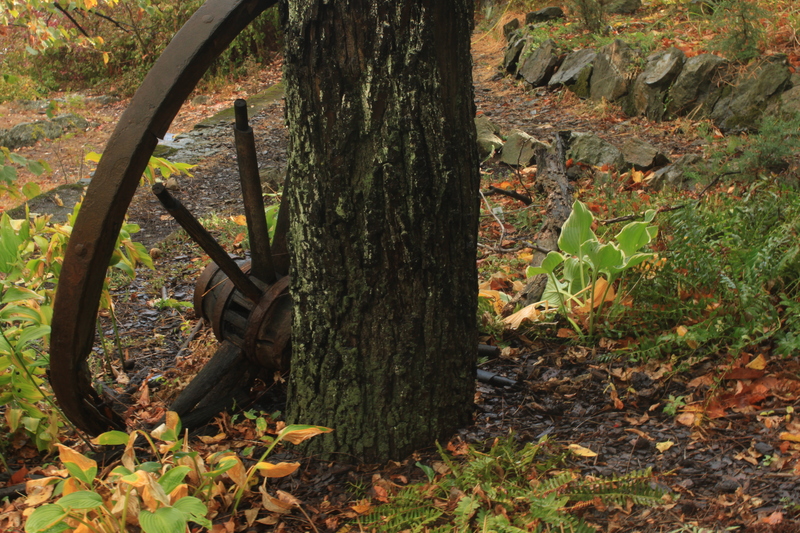 Next time: Revisiting Clinton Road in West Milford, New Jersey — or more accurately, revisiting its stories, but visiting it itself for the first time. Stay tuned!